TRIPLE CHARM – Cheer on your favorite players! Two stainless steel and brass washers hand-stamped in lower case Bridgette font, pewter baseball and bat charms, brass glove charm, sterling silver initial disc, blue brushed steel and brass patterned beads. 22″ stainless steel ball chain. $50 as shown. I really love baseball. I went to bed at night as a kid listening to the Kansas City Royals on radio. My brother and I played catch in the backyard every morning for many summers. Softball nights were always something I looked forward to. I loved watching American Legion games in high school, not just because it was a social event where all the cute guys would be. I’d go to my brother’s games, if he was playing or umpiring, and now I get to cheer for my own kids, who play at all different levels. Their teams all had so-so results this season, though they all finished strong. My oldest even hit a home run in his last game yesterday. So even though all the running around and traveling is now over, I’ll miss those relaxing nights out at the ball field, taking pictures, meeting new friends. Football and basketball start soon enough, but that’s just never the same. At least we still have the MLB! 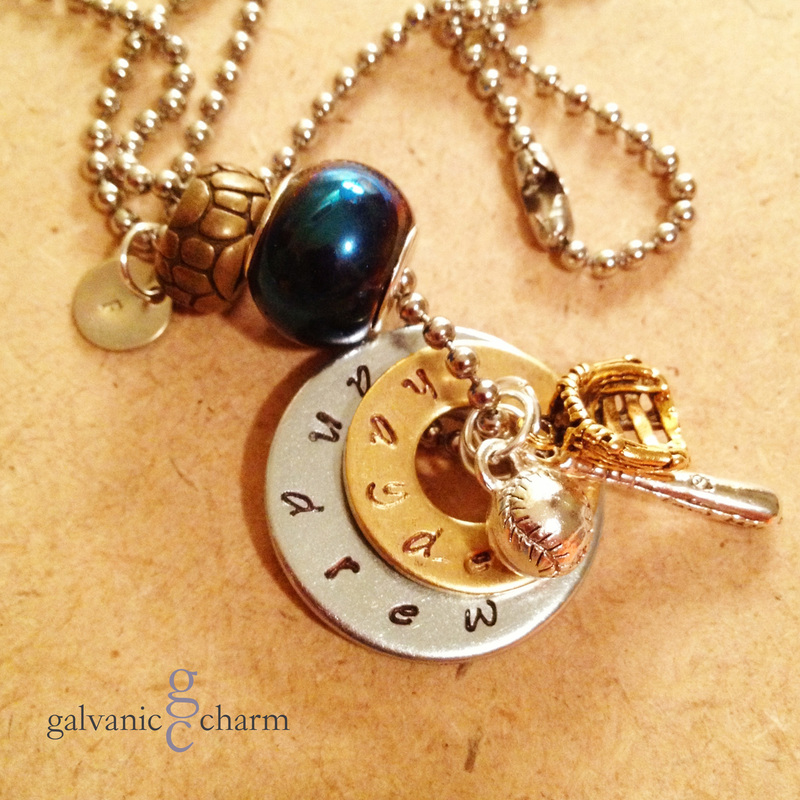 Here’s the latest baseball charm necklace by Galvanic Charm. Order on Etsy or Facebook! Or you can even send me an email or message through the blog!